Featuring a 10-lane competition pool and an 8-lane training pool, the 3,000-seat OCBC Aquatic Centre is proud to be home to Singapore Swimming Association. Having hosted both the 28th South East Asian Games 2015 and the 5th FINA World Juniors Swimming Championships 2015, this world-class facility is the perfect location for hosting a variety of community, regional and international competitions. The OCBC Aquatic Centre provides more ways than one for you to get in on the action at the Singapore Sports Hub! Plan a total body workout with an afternoon of lap swimming, or make a splash at our range of aqua fitness classes! Whether you’re a novice or an experienced swimmer, lap swimming makes for an excellent workout. From aqua biking and aqua fit classes to Learn-to-Swim programmes, our variety of programmes are designed for every skill level and interest! Smash your personal best at the OCBC Aquatic Centre! Whether you’re a novice or an experienced swimmer, lap swimming makes for an excellent workout. Rain or shine, get in a great workout with us today! Our lap swimming hours are from 7AM to 10PM in the training pool. The competition pool is available on selected days and will be in 25m or 50m configuration. Check out our various Swim Passes to enjoy greater savings! **For the ‘8-Visit Swim Pass’, the Card is transferable to a friend or family member and only within the same or lower pricing category but is not exchangeable with cash or another voucher and shall not be replaced if lost. Terms & Conditions apply. Please click here for details. For safety reasons, please refer to the Pool Safety & Adult-Child Supervisory Ratio. Click here to view the lap lane etiquette. For group bookings or any other enquiries, please contact us at ocbc.aquatic-centre@sportshub.com.sg. If you are visiting us for the first time, do read our General Admission Information here. Let’s do our part in keeping the Singapore Sports Hub a smoke-free campus. To create a fun and conducive environment for all, please read our Conditions of Entry (Non-Events) prior to your visit. If you are here to catch some exciting water action, please read our Conditions of Entry (Events). New to swimming? From your first splash to building water confidence, join our various swimming programmes for a splashing good time! *Do note that all classes comprise of participants of different age groups. Attire Swimwear of colourfast and lightweight material suitable for swimwear, such as lycra, spandex or nylon. Equipment Equipment for all classes will be provided. Registration Information How to Register? Fill up this form and bring it to the OCBC Aquatic Centre Information Counter (Level 1) where you can make payment and book a slot. Do note that we have limited slots available for each class. Term 1 registration is now closed. Swim Assessment If you are a first timer, or have prior swimming experience but are unsure of your swim level, feel free to drop us an email at ocbc.aquatic-centre@sportshub.com.sg to request for a swim assessment to find a suitable class for you to enrol in. Take the plunge into a healthier lifestyle and explore all the aquatics programmes that the Singapore Sports Hub has to offer! Early Bird Promotion One (1) complimentary session applicable of the same category or lower. Full-term participants get to enjoy attractive early bird rate at $148 for June Aqua Fitness Pass during the Early Bird period only. The Aqua Fitness Pass is back again! Be sure to catch the early bird promotion! For just $168 (24 April to 12 May 2019), enjoy up to 17 Aqua Fitness Sessions (worth $430) + 2 FREE SESSIONS*! Get your Aqua Fitness Pass from 24 April 2019 at the OCBC Aquatic Centre between 7AM to 10PM daily and join us for a splashing good time! *2 free sessions redeemable next term (Term 3, July - Sep 2019). Based on first-come, first-served basis. Fill up the indemnity form and make payment for the unlimited pass from the Customer Care Counter. Booking of class starts on Monday, 27 May 2019 onwards. Availability is based on first come first serve. Participants may book their classes by calling 6653 8900 between 10:00AM to 5:00PM daily. Name and serial number of pass must be provided upon booking. You may help to book for your friend by providing their name and serial number as well. Available from 7:00AM to 10:00PM daily at the Customer Care Counter. Looking for a one-time off aqua fitness experience or a few single sessions due to busy schedule? Step right up to our counter to sign up for individual aqua fitness class. From 27 May 2019 onwards, patrons can drop-in to OCBC Aquatic Centre information counter to fill up the indemnity form and make payment. Swimwear of colourfast and lightweight material suitable for swimwear, such as lycra, spandex or nylon. The Hydrorider AquaBike enables anyone to work out in the water regardless of their fitness level. The cooling effect of water reduces the discomfort of sweating whilst reducing pressure on the heart, and the buoyancy of the water gives support around the joints. Each session is structured by different workouts such as acceleration, stretching exercises as well as exercises on or off the bike. You will not only pedal in water but climb, lift and sprint. There is no one best way to get fit, lose weight and eliminate cellulite! The Aqua Bike is the ideal sport for everyone. A total body work out to reshape and tone up your body, while improving cardiovascular endurance and burning a massive amount of calories. With a combination of cycling and resistance band training for the upper body, this improves not only your coordination skills but an overall body conditioning. So, Spin to the upbeat music to this energetic workout that will leave you exhilarated & re-energized. Spin Aqua Tone aids in recondition and strengthens joints and muscles in the safest environment possible. SAF Aqua Drums Vibes ® Combo combines 30-minutes Aqua Drums and 30-minutes Shallow. In Deepwater, a floatation belt is used for a non-impact drumming workout. The movements in the deeper end requires engaging the core muscles for stability while combining with the various upper body routines while Shallow combine more intense movements as we splash and drum away the stress of the day! We'll take you on an amazing world of rhythm and energy hidden in the water with an effective training. This is an hour of water aerobics exercise done in shallow water at chest depth. The resistance of the water makes the workout more intense while cushioning the joints from impact. An overall endurance and toning class suitable for all. Class will be modified to fit individual needs, making it easy for everyone of different fitness levels to follow. Fit+Deepwater Aqua HIIT incorporates high & low (HiLo) intensity exercises that will increase cardiovascular, strength and stability. Combination of Shallow & Deepwater workout with the use of a floatation belt at the deep end which keeps the body suspended in the water. The ‘Hi’ energy workout challenges the respiratory system. Usually short burst quick movements. The ‘Lo’ takes form of the active recovery. Movements are long range while engaging the core muscles. This high energy non-impact overall body conditioning aqua fitness class will leave you feeling refresh revitalize and injury free. Aqua Fit + Deepwater HIIT incorporates high & low (HiLo) intensity exercises that will increase cardiovascular, strength and stability. This non-impact workout with the use of a floatation belt keeps the body suspended in the water. Aqua Tabata is a 45 minutes high-intensity interval training that works both the aerobic and anaerobic systems. This training involves performing a particular exercise at high intensity for 20 seconds followed by 10 seconds of rest. This is repeated 8 times for a total training time of 4 minutes. Deepwater Aqua is a non-impact aquatic exercise done at the deeper end of the pool with the use of a floatation belt. It is suitable for swimmers and non-swimmers. The belt stabilizes and keeps you afloat. Your feet do not touch the bottom of the pool. An exercise great for those who have joint issues yet wanting to maintain cardiovascular endurance and muscle strength. Running in water provides great resistance training and less traumatic then running on land yet reaping similar benefits. Spice up your training routine with our upbeat water aerobics sessions! The resistance of the water makes the workout more intense while cushioning the joints from impact. Done in shallow water at chest depth, this class is easy to follow and gets you an intense all-over workout without harming the joints. Our friendly instructions will modify classes to suit your individual needs. Tone up, gain muscle endurance and leave feeling fantastic! An overall endurance and toning class suitable for all. Fundamentals of diving will be introduced. Development of rescue skills and personal survival knowledge will also continue at more advanced levels. Children will be required to demonstrate efficient stroke techniques with timing to complete the silver stage. Pre-requisite Able to swim all 3 strokes (Freestyle, Backstroke and Breaststroke) and/or have a SwimSafer Bronze certification. Children will be required to perform strokes with greater ease, efficiency, power and smoothness over 400 metres with timing. Rescue skills and water safety knowledge will focus on lifesaving readiness. Standing dive and personal safety skills will continue to be taught. Pre-requisite Able to swim all 3 strokes (Freestyle, Backstroke and Breaststroke) and/or have a SwimSafer Silver certification. In Deepwater, a floatation belt is used for a non-impact drumming workout. The movements in the deeper end engages the core muscles of participants for stability while combining with the various upper body routines. On the other hand, Shallow combine more intense movements as we splash and drum away the stress of the day! We'll take you on an amazing world of rhythm and energy hidden in the water with an effective training. Doctors now recommend water-based training to rehabilitate injury. Due to the resistance of the water, strength training and cardiovascular conditioning are just as effective as land-based training. For those suffering from joint or back pain, arthritis, obesity, injury, or other conditions that make land-training painful and challenging, sign up to enjoy the results and benefits of water personal training. Aqua personal training will help push your workouts to another level, realizing your health and wellness goals. A customised exercise programme just for you, each private session is designed for a class size of 1 - 4 pax. Day/Dates Aqua Personal Training classes can be arranged to be held at your preferred dates and time (subjected to instructor’s availability). Sign-up/ Enquiry Kindly email us at ocbc.aquatic-centre@sportshub.com.sg for more details. Please ensure that you bring along a valid photo ID for verification and you are encouraged to read through our pool admission policy prior to your visit. What are the opening hours of the OCBC Aquatic Centre? What are the opening hours of the training pool and competition pool? The training pool is accessible from 7:00AM to 10:00PM, Monday to Sunday. You may refer to the Pool Opening Hours section for the details of the pool opening hours. How can I reserve a lane for lap swimming? You may reserve a lane via our online booking system or make a booking at our information counter located at OCBC Aquatic Centre (Level 1). Please note that a maximum of 4 swimmers are allowed in each lane. We accept cash, NETS and credit card (VISA and MasterCard) payments. Are there any lockers available? Yes, lockers are available at no additional charges and they are located in the changing rooms. Please note that all lockers have to be cleared before the end of the public operating hours. Can I bring my kid for a swim? Yes, please be advised that you will need to adhere to the adult-child supervisory ratio and you are encouraged to read through our admission policy prior to your visit. What is the average temperature of the training pool and competition pool? The average temperature of the training pool and competition pool is 27.5 degree Celsius and 28.5 degree Celsius respectively. Can I view the training pool? No, public viewing of the training pool is prohibited. I am unable to find the answers. Who can I contact for more details? You may send your enquiry through our online form or call us at +65 6653 8900 (Monday to Sunday, 7:00AM to 10:00PM). How can I register for the aqua fitness classes? You will need to complete this form and make the payment at our information counter located at the OCBC Aquatic Centre (Level 1). Please note that your registration is confirmed upon receipt of the payment and completed registration form. Is there a minimum class size for the aquatic fitness classes? Yes, we will require a minimum of 6 participants before the class is confirmed. A minimum of 5 participants will be required for the aqua bike programmes. What is the maximum class size for the aquatic fitness classes? The maximum class size is 20 participants. For aqua bike programmes, the maximum class size is 10 participants. If I am unable to attend the classes, will I be entitled to any make-up sessions or refunds? There will be no refunds or make-up classes for any missed lessons. Is there a minimum age requirement to participate in the aqua fitness classes? Yes, you will need to be at least 18 years old to register for the aqua fitness classes. How can I register for the swimming lessons? ​​You will need to complete this form and make the payment at our information counter located at the OCBC Aquatic Centre (Level 1). Please note that your registration is confirmed upon receipt of the payment and completed registration form. Is there a minimum class size for the swimming lessons? What is the maximum class size for the swimming lessons? The maximum class size varies depending on the swim level programmes. What is the duration of the swimming lessons? The duration for each session is 60 minutes. What do I need to bring when attending the swimming lessons? You will need to bring your own swimsuit, goggles and swim cap (optional). Do you offer any private swimming lessons? What are the different types of swim passes available for purchase? We offer 3 different swim passes and they include 30 Days Swim Pass, 90 Days Swim Pass and 8 Visits + 2 (10 Visits) Swim Pass. Where can I purchase the swim pass? You may purchase the swim pass at our information counter located OCBC Aquatic Centre (Level 1). You will need to produce a valid photo ID for verification when making the purchase. Are the swim passes transferable? As both 30 Days and 90 Days Swim Passes are non-transferable, you are required to produce a valid photo ID for each visit. 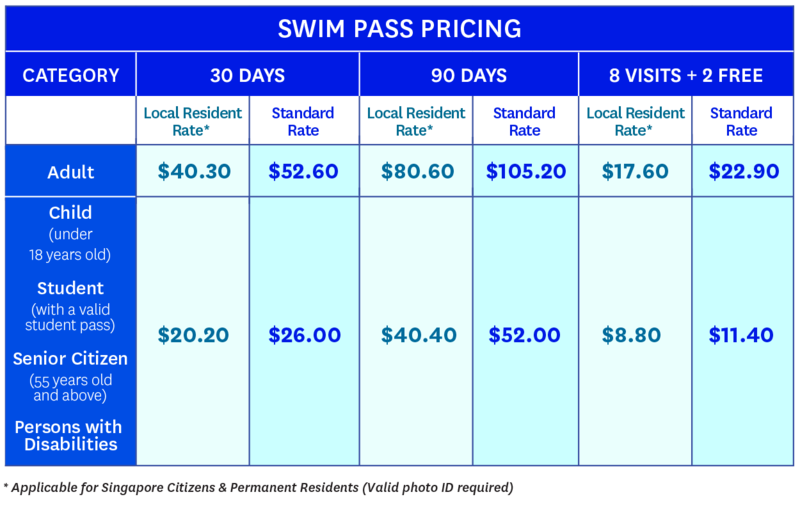 The 8-Visit Swim Pass is a transferable pass only within each or lower pricing category and it can be shared among your family members and friends. I have lost my swim pass. What should I do? There will be no replacement for any lost 8-Visit Swim Passes. For non-transferable passes, there will be a replacement fee of S$20.00 for each lost card and you may request for a replacement card at our information counter located at the OCBC Aquatic Centre (Level 1). I am unable to fully utilise the swim pass due to a medical condition. Can I request for an extension of the validity period? Extensions are granted on a case-by-case basis and you may send your request to ocbc.aquatic-centre@sportshub.com.sg or contact us at +65 6653 8900 (Monday to Sunday, 7:00AM to 10:00PM). Please be informed that you are required to produce your medical certificate for verification and the request must be made prior to the expiry date of the pass. Will I be entitled to any refund of the pass if the venue is closed for events? No, the validity period of the passes will be extended accordingly to account for any closure of the venue.